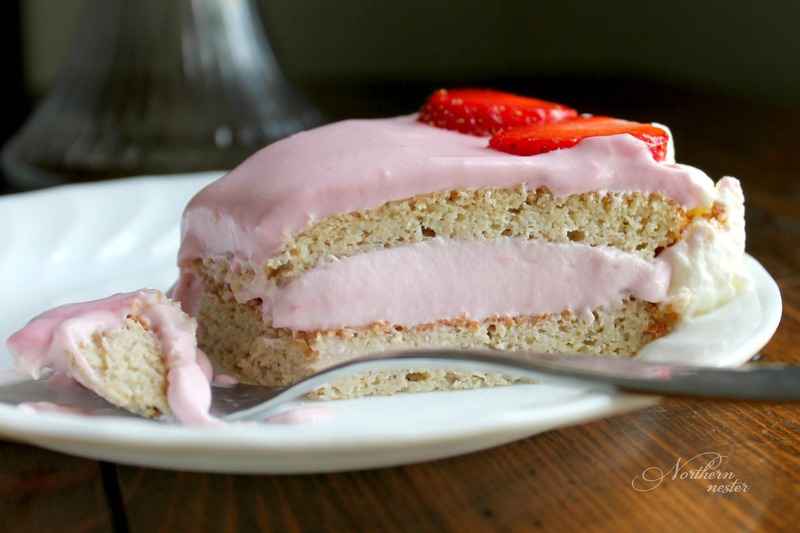 This white layer mousse cake is the perfect way to use frozen Summer berries! A THM S, you can choose from blueberries, strawberries, raspberries, blackberries – or even a mix! – to easily change the flavors and colors of the light and fluffy mousse filling. The cake layers of this dessert are phenomenal on their own. If you’re short on time, you could just bake the cake and serve it with fresh berries and cream. It’s kind of a cross between a sponge cake and a pound cake. Pysllium powder is the only “special” ingredient in this dessert, but I decided to use it because it’s something my local grocery store carries now. You probably have all the other pantry staples on hand: almond flour, coconut flour, vanilla extract, gelatin (Just Gelatin, Great Lakes, or Knox will work), baking powder, and sweetener (I used xylitol as usual, but you could use half the amount in Gentle Sweet). This elegant THM S white layer cake is a phenomenal way to enjoy in season summer berries! A perfect cake for birthdays or serving a crowd. Preheat oven to 350. Line 9" baking pan with parchment paper. Melt butter and let it cool. Beat eggs for 5-6 minutes until very light and fluffy. Add in cooled butter and sour cream. Mix thoroughly. In a separate bowl, stir dry ingredients together. Add to wet ingredients and stir until just combined. Pour batter into pan and bake at 350 for 35-40 minutes, or until toothpick comes out clean. Let cake cool completely while you prepare the filling. To make the mousse filling, bring berries and water to a boil in saucepan until they become liquid. In the mean time, soften gelatin in another dish by pouring 1/4 cup of water over top of the powder. Set aside. Remove berries from heat and press through a fine sieve or cheesecloth. Blend half the berry juice together with the cream cheese and xylitol. Return the remaining berry juice in the saucepan to stove and stir in the softened gelatin until completely dissolved. Stir into cream cheese mixture. Beat whipping cream in a separate bowl and fold into berry mixture. Chill in fridge for an hour to set completely. To assemble the dessert, slice cake into 2 layers, horizontally. Place first layer on a serving plate. Carefully spread 1/2 the mousse. Add second cake layer. Spread on remaining mousse. Beat whipping cream and xylitol together, pipe or spread onto sides of cake, and refrigerate overnight. Optional: decorate with berries before serving. If you don't have the time to make the mousse filling, the cake layer is delicious on its own served with berries and whipped cream!